“We believe that the use of NASA LED for light therapy alone, and in conjunction with hyperbaric oxygen, will greatly enhance the natural wound healing process, and more quickly return the patient to a preinjury/illness level of activity.” Read the Complete NASA Study. The video below is from a clinical trial performed with cancer patients based on NASA research. Photon Therapy is not new. The barrier to widespread use has been the lack of a device that is both powerful enough for fast results and affordable – until now. Bales Photonics new Firefly can bring this non-invasive therapy option to doctors and alternative therapy practitioners at a fraction of the cost. We are currently investigating the effects of light-based frequency therapy on Dementia patients in multiple clinical trials. If you, a loved one, or a friend have been recently diagnosed with Dementia by a Medical Doctor and are interested in participating please contact Dr. Martin Bales at martin@balesphotonics.com or call 619-886-5580. Trials are currently taking place in Orange County, Southern California and West Bloomfield Township, Michigan. After applying Firefly Light Therapy on my father (who has Alzheimer’s and Parkinson’s disease) for about 3-4 weeks, he is more alert and responsive and his neck flexibility has improved so he can turn his head from left to right. Moreover, it has helped him swallow. I am so grateful for this therapy and believe there will be more positive outcomes as we continue treatment. Thank you! The Potential of Near-Infrared Light Therapy in Alzheimer’s and Parkinson’s Disease. This article is a review of many research studies. Read and download the entire article here. Although in its infancy, with the bulk of results still at the pre-clinical “proof of concept” stage, NIr (Near-infrared) therapy has the potential to develop into a safe and eﬀective neuroprotective treatment for patients with Alzheimer’s and Parkinson’s disease (and presumably other neurodegenerative diseases such multiple sclerosis and amyotrophic lateral sclerosis). If NIr was applied at early stages of the disease process, for example at ﬁrst diagnosis, it could potentially slow further progression by protecting neurons from death. Consequently, over time, the greater neuronal survival would lessen the clinical signs and symptoms. Further, NIr therapy—because of its lack of side-eﬀects and neuroprotective potential—is amenable to use in conjunction with other treatments. For example, patients may have NIr therapy with a reduced dosage of drugs as a ﬁrst line treatment; the potential neuroprotective eﬀect oF NIr could prolong the eﬃcacy of the drug therapy. Further, in Parkinson’s patients selected for deep brain stimulation, they may also have an NIr optical ﬁber implanted surgically at the same time, thereby potentially oﬀering neuroprotection of the remaining dopaminergic cells. There is much to do in further developing this treatment, but the therapeutic possibilities are many and the potential outcomes very exciting. We await the outcomes of major clinical trials using NIr therapy on these patients with much anticipation. This article references over 29 different studies. CONCLUSION: Contrary to conventional wisdom, brain regeneration is possible. One promising therapy that promotes neurogenesis and is effective in pre-clinical studies of Alzheimer’s and Parkinson’s is near-infrared light therapy, and it may improve other mental illnesses and neurodegenerative disorders including dementia, stroke, ALS, and traumatic brain injury as well. Given its large margin of safety and lack of adverse effects, near-infrared light therapy should be offered as an option for patients suffering from a myriad of chronic conditions, but is especially promising for neurodegenerative diseases including Alzheimer’s and Parkinson’s and may even have future use in multiple sclerosis. Near-infrared therapy is superior to the mainstay drug treatments for these diseases since pre-clinical studies have demonstrated proof-of-concept that near-infrared either arrests or slows the underlying pathology of these disease processes and leads to the birth of new neurons, rather than merely mitigating symptoms (10). Read and download the entire article here. ABSTRACT: Context. Peripheral neuropathy is one of the most common complications of diabetes. Objectives. The purpose of this study was to evaluate the effects of photon stimulation on pain intensity, pain relief, pain qualities, and sensation and quality of life (QOL) in patients with painful diabetic peripheral neuropathy. Methods. In this randomized, placebo-controlled trial, patients were assigned to receive either four photon stimulations (n . 63) or four placebo (n . 58) treatments. Pain intensity, pain relief, and pain qualities were assessed using self report questionnaires. Sensation was evaluated using monofilament testing. QOL was measured using the Medical Outcomes Study Short Form-36 (SF-36). Multilevel regression model analyses were used to evaluate between-group differences in study outcomes. Results. No differences, over time, in any pain intensity scores (i.e., pain intensity immediately posttreatment, average pain, worst pain) or pain relief scores were found between the placebo and treatment groups. However, significant decreases, over time, were found in some pain quality scores, and significant improvements in sensation were found in patients who received the photon stimulation compared with placebo. In addition, patients in the treatment group reported significant improvements in SF-36 social functioning and mental health scores. Findings from a responder analysis demonstrated that no differences were found in the percentages of patients in the placebo and treatment groups who received 30% or more or 50% or more reduction in pain scores immediately posttreatment. However, significant differences were found in the distribution of the changes in pain relief scores, with most of the patients in the photon stimulation group reporting a slight (28.6%) to moderate (34.9%) improvement in pain relief from the beginning to the end of the study compared with no change in pain relief (43.1%) in the placebo group. Conclusions. Four treatments with photon stimulation resulted in significant improvements in some pain qualities, sensation, and QOL outcomes in a sample of patients with a significant amount of pain and disability from their diabetes. A longer duration study is needed to further refine the photon stimulation treatment protocol in these chronically ill patients and to evaluate the sustainability of its effects. J Pain Symptom Manage 2009;- :-e- . 2009 U.S.
Cancer Pain Relief Committee. Published by Elsevier Inc. All rights reserved. ABSTRACT: Three diverse problems were studied, the first of which was “chronic painful diabetic neuropathy.” This was typified by cold, painful feet. Photon therapy over the acupuncture sites and over the afflicted area resulted in increased temperature and amelioration of pain in many patients. In addition, it was noted that those who became temperature coherent (we noted a wide dispersion of recorded temperatures in symptomatic patients) were associated with better assessment of the technique by the patient.The second group of “chronic myofascial pain” syndrome patients typically demonstrated an increased are of temperature in the skin, were also treated by utilization of typical acupuncture points. For the most part, clinical improvement in pain ratings were noted associated with decreased skin temperature in affected areas becoming side-to-side coherent over time. A third patient with complex regional pain syndrome type II was also treated with this technology with clinical improvement in his previously dramatically reduced skin temperature without admission of any basic symptom change. It is felt that the infrared energy creates a change in the potentiostatic electrochemical process which invokes a non-local coupling reaction in the body’s electrical system. This would also indicate a new anatomical designation of acupuncture treatment points in correspondence with the older nomenclature which was often misleading.This is the first overall reporting of a treatment utilizing the body’s own “electrical buttons” as opposed to invoking electrical change of an internal or external invasive or semi-invasive procedure. Photon stimulation therapy for chronic regional pain syndrome: a new technique. Complex regional pain syndrome type I, previously known as reflex asymmetry dystrophy is notoriously difficult to treat. We report on the significant temperature reduction and side-to-side symmetry noted in one patient treated with infrared photon therapy. We review recently published experience with the photon stimulator in chronic diabetic painful neuropathy and chronic pain syndrome. Significant temperature asymmetries which were the hallmark of these other disorders were likewise similarly affected. Considerations for acupuncture type of electrochemical process change in non-local coupling functions are thought to be responsible. Neuromodulation and neuroaugmentation by this technology seem to be helpful in the amelioration of this chronic painful condition. by Deborah Fralicker, D.C., Jacob Green, M.D., Ph.D., William Clewell, Ph.D., George Ossi, B.S., and Minnie Briley, C.M.E.T. ABSTRACT: Classical spinal and peripheral acupuncture treatment points were stimulated by an FDA approved infrared photon device in the treatment of chronic myofascial pain. Favorable assessments by the patients of this new mode of photon therapy were reported for both groups. A significant reduction in the patient’s level of pain using the standard visual analog scale for pain measurement were found. A reduction of the classic hotter (spot) skin surface temperatures in the area of the myofascial complaints that the surrounding body in both groups of patients. This infrared photon therapy device appears quite acceptable for the outpatient treatments in chiropractic physicians offices, especially those with an interest in myofascial pain and knowledge of acupuncture technique. Healing of Bone Affections and Gangrene with Low-Intensity Laser Irradiation in Diabetic Patients Suffering from Foot Infections. OBJECTIVE: Evalution of low-intensity laser irradiation on the healing of bone affections and gangrene in patients suffering from diabetic microangiopathy. PATIENTS: Two consecutive diabetic male patients with gangrene, osteomyelitis, and bone fractures. INTERVENTION: Helium-neon laser irradiation (36 J/cm2 ) 50 min/day. MAIN OUTCOME PARAMETER: Healing of gangrene and corticalis lesion as well as remineralisation of bone affections. RESULTS: Within a mean period of 14 weeks not only a complete healing of the diabetic gangrenes but also a radiographically determined reestablishment of corticalis and remineralisation of preexisting bone affections could be achieved. OBJECTIVE: Diabetic foot problems due to angiopathy and neuropathy account for 50% of all nontraumatic amputations and constitute a significant economic burden to society. Low-intensity laser irradiation has been shown to induce wound healing in conditions of reduced microcirculation. We investigated the influence of low-intensity laser irradiation by means of infrared thermography on skin blood circulation in diabetic patients with diabetic microangiopathy. 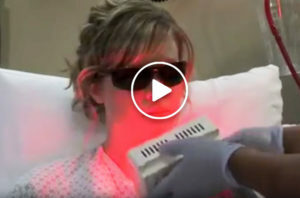 RESEARCH DESIGN AND METHODS: Thirty consecutive patients with diabetic ulcers or gangrenes and elevated levels of glycosylated hemoglobin were randomized by blocks of two to receive either a single low-intensity laser irradiation with an energy density of 30 J/cm2 or a sham irradiation over both forefoot regions in a double-blind placebo-controlled clinical study. Skin blood circulation as indicated by temperature recordings over the forefoot region was detected by infrared thermography. RESULTS: After a single transcutaneous low-intensity laser irradiation, a statistically significant rise in skin temperature was noted (P < 0.001 by ANOVA for repeated measurements), whereas in the sham-irradiated control group, a slight but significant drop in temperature (P < 0.001) was found. Subsequently performed contrasts for comparison of measurements before and after irradiation revealed significant temperature increases at 20 min of irradiation time (P < 0.001), at the end of the irradiation (P < 0.001), and 15 min after stopping the irradiation (P < 0.001). In the sham-irradiated feet, the drop in local skin temperature was not significant at 20 min (P = 0.1), but reached significance at the end of the sham-irradiation procedure (P < 0.001) and 15 min after the end of sham irradiation (P < 0.001). CONCLUSIONS: The data from this first randomized double-blind placebo-controlled clinical trial demonstrate an increase in skin microcirculation due to athermic laser irradiation in patients with diabetic microangiopathy. Diabetic neuropathic foot ulcer: successful treatment by low-intensity laser therapy. OBJECTIVE: To evaluate the efficacy of low-intensity laser irradiation for the induction of wound healing of a diabetic neuropathic foot ulcer. CASE: We report a case of a man with insulin-dependent diabetes mellitus, sensory neuropathy, macroangiopathy and microangiopathy who had been suffering from an ulcer of his first left toe accompanied by osteomyelitis for 6 weeks. RESULTS: After a total of 16 sessions of low-intensity laser therapy using a 670-nm diode laser administered within a 4-week period the ulcer healed completely. During a follow-up period of 9 months, there was no recurrence of the ulcer even though the patient’s metabolic condition remained unstable. CONCLUSIONS: Although laser therapy was not applied as a monotherapy, the present observation suggests that it might constitute a useful side-effect-free alternative treatment modality for the induction of wound healing of neuropathic ulcers in diabetic patients. Therefore large properly controlled randomized studies seem justified. Induction of complete wound healing in recalcitrant ulcers by low-intensity laser irradiation depends on ulcer cause and size. Chronic skin ulcers still represent a therapeutic challenge in dermatology. Among the various non-invasive treatment modalities used for the improvement of impaired wound healing, low-intensity laser irradiations are gaining an increasing body of interest. We used low-intensity laser irradiations delivered by a 30 mW helium-neon laser at an energy density of 30 J/cm2 three times weekly for the induction of wound healing in ulcers of diverse causes. Twenty patients with the same number of ulcers, which had previously been treated by conventional wound care for a median period of 34 weeks (range: 3-120 weeks) without any significant evidence of healing, were included in the study. Concerning the underlying disorders, patients were divided into four groups: diabetes, arterial insufficiency, radio damage and autoimmune vasculitis. In all ulcers, complete epithelization could be induced by laser therapy. No amputation or any other surgical intervention was necessary and no adverse effects of any kind were noted during low-intensity laser treatment. Regarding the different diagnoses, a statistically significant difference was noted (P = 0.008): ulcers due to radio damage healed significantly faster than those caused by diabetes (6 weeks [range: 3-10 weeks] vs. 16 weeks [range: 9-45 weeks], P = 0.005). Wound healing in autoimmune vasculitis (24 weeks [range: 20-35 weeks]) required longer than in radiodermitis, although the difference was not significant. In addition to the diagnosis, wound size was found to be an important factor influencing the duration of wound closure (P = 0.028), whereas duration of previous conventional treatment (P = 0.24) and depth (P = 0.14) showed no effect. Our results indicate that low-intensity laser irradiation could be a valuable non-invasive tool for the induction of wound healing in recalcitrant ulcers, and that healing time is correlated with the ulcer cause and size. GaAs laser treatment of venous ulcers. In a study extended over 6 years Soriano treated 231 patients with venous leg ulcers. The exclusion criterias were diabetes, arterial disease, vasculitis, congestive heart failure and loss of follow up at 6 months. 122 of 154 patients in the laser group fulfilled the study. In the control group (traditional treatment only) 46 of 77 patients fulfilled. Wounds were all of Size Rate 4 or larger (diameter major + diameter minor). A 40 mW GaAs laser at 10.000 Hz was used, The laser was applied in the point technique with a dose of 3 J/cm2 per point around the border and onto the bed of the ulcer in non contact. Three sessions a week were performed for 4 months, or until the ulcer was completely healed. The results were evaluated as complete healing, partial healing (more than 50%) or non healing (less than 50%). In the laser group there was a 70% healing rate and a 14% rate of partial healing. In the control group 26% of the patients had a complete healing and 22% a partial healing. In the laser group, only 19% of the ulcers of great size (>16) healed completely and if the wound was more than one year old, the percentage of complete healing was 40%. Wounds with an oedema failed to heal with the parameters used. Low intensity laser irradiation in the treatment of recalcitrant radiation ulcers in patients with breast cancer–long-term results of 3 cases. Radiotherapy can be followed by recalcitrant skin ulcers. As low intensity laser irradiation has been demonstrated to have a beneficial effect on impaired wound healing, we investigated its efficacy and safety in three patients with chronic radiation ulcers. The three patients, previously mastectomized due to breast cancer, with recalcitrant radiation ulcers of the skin were treated with a 30 mW helium-neon laser (wavelength: 632.8 nm, intensity: 3 mW/cm2, dose: 30 J/ cm2) three times weekly. In all patients, complete wound closure was achieved within a period of 7, 5, and 8 weeks. One patient died 6 weeks after laser treatment due to tumor cachexia. Neither of the other patients showed recurrence of radiation ulcers or neoplasm during a follow-up of 36 months. Low intensity helium-neon laser irradiation has been shown to be effective in the induction of wound healing in radiotherapy-induced ulcers in three patients with breast cancer. “The sympathetic nervous system (SNS) controls these changes and changes in the sympathetics cause changes in the thermal imaging which do not conform to dermatomal patterns”. Thermography is exacting in measuring temperature and temperature differences. USES: New cameras have real-time imaging properties that could help monitor a limb while a spinal cord stimulator is being installed. Thermography could help the surgeon place the leads accurately so that the patient gets maximum benefit from the stimulator. DIAGNOSING CRPS: Thermography is the best tool we have to date to help us with diagnosis of CRPS. It also completely validates the symptoms described by the patient. he/she is not making it up, exaggerating or hallucinating. Earlier diagnosis means earlier treatment and a better prognosis. Thermography continues to surprise us with its uses and is a valuable help in making a diagnosis of CRPS. ABSTRACT: Far-red and near infrared (NIR) light promotes wound healing, but the mechanism is poorly understood. Our previous studies using 670 nm light-emitting diode (LED) arrays suggest that cytochrome c oxidase, a photo acceptor in the NIR range, plays an important role in therapeutic photobiomodulation. If this is true, then an irreversible inhibitor of cytochrome c oxidase, potassium cyanide (KCN), should compete with LED and reduce its beneficial effects. Results: This hypothesis was tested on primary cultured neurons. LED treatment partially restored enzyme activity blocked by 10–100 M KCN. It significantly reduced neuronal cell death induced by 300 M KCN from 83.6 to 43.5%. However, at 1–100 mM KCN, the protective effects of LED decreased, and neuronal deaths increased. LED significantly restored neuronal ATP content only at 10 M KCN but not at higher concentrations of KCN tested. Pretreatment with LED-enhanced efficacy of LED during exposure to 10 or 100 M KCN but did not restore enzyme activity to control levels. In contrast, LED was able to completely reverse the detrimental effect of tetrodotoxin, which only indirectly down-regulated enzyme levels. Among the wavelengths tested (670, 728, 770, 830, and 880 nm), the most effective ones (830 nm, 670 nm) paralleled the NIR absorption spectrum of oxidized cytochrome c oxidase, whereas the least effective wavelength, 728 nm, did not. Conclusions: The results are consistent with our hypothesis that the mechanism of photobiomodulation involves the up-regulation of cytochrome c oxidase, leading to increased energy metabolism in neurons functionally inactivated by toxins. by Jean Stelian, M.D., Israel Gil, M.D., Beni Habot, M.D., Michael Rosenthal, M.D., Julian Abramovici, M.D., Nathalia Kutok, M.D., and Auni Khahil, M.D. ABSTRACT: Objective: To evaluate the effects of low-power light therapy on pain and disability in elderly patients with degenerative osteoarthritis of the knee. Design: Partially double-blinded, full randomized trial comparing red, infrared, and placebo light emitters. Patients: 50 patients with degenerative osteoarthritis of both knees were randomly assigned to three treatment groups: red (15 patients), infrared (18 patients), and placebo (17 patients). Infrared and placebo emitters were double-blinded. Interventions: Self-applied treatment to both sides of the knee for 15 minutes twice a day for 10 days. Main Outcomes: Short-form McGill Pain Questionnaire, Present Pain Intensity, and Visual Analog Scale for pain and Disability Index Questionnaire for disability were used. We evaluated pain and disability before and on the tenth day of therapy. The period from the end of the treatment until the patient’s request to be retreated was summed up 1 year after the trial.